Thinking about getting that old bicycle back on the road? Give your bicycle the full works with a Deluxe Service. This service ensures every aspect of your bike is working perfectly and safely before you hit the road. Pickup and delivery available. The Bicycle Repair Man, David Cheung is a master craftsman able to service all kinds of specialty bicycles. As an experience mechanic David can repair hydraulics and pneumatics as well as rebuild frames and wheels. 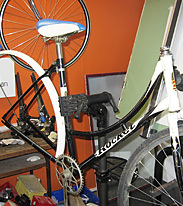 The Bicycle Repair Man offers a variety of services ranging from general to premium servicing and repairs. Restoration of old and antique bikes is also possible. 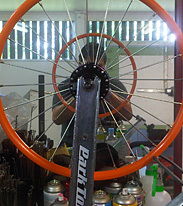 If you are unsure about what your bike requires David is happy to inspect and quote. 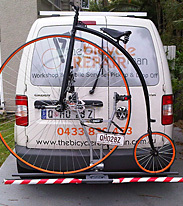 The Bicycle Repair Man can often be found at cycling events in and around Brisbane and the Gold Coast offering minor repairs and servicing. More involved servicing and repairs have to be done in the workshop also including a $20 transportation fee. What do David's customers think? Can 100% recommend David from the Bicycle repairman. He gave a fair and honest quote, was able to pick up and deliver my bike in one day. Needed to upgrade the groupset to my Cannondale got my stuff on line. Dave pick up my bike and returned it the next day. He even did a few extra repair for free. Great service and good price. I recommend him to all my mates. David did a complete overhaul of my bike that had been left out in the weather for the last five years. It now looks like new and I could not be happier. David takes a lot of pride in what he does.